KE00019 is a solid phase sandwich Enzyme Linked-Immuno-Sorbent Assay (Sandwich ELISA). 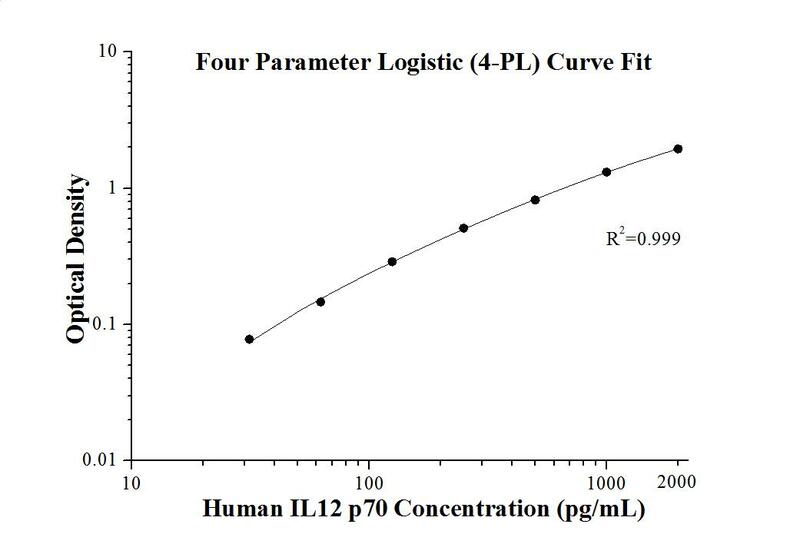 The IL12 p70 ELISA kit is to be used to detect and quantify protein levels of endogenous IL12 p70. The assay recognizes human IL12 p70. A monoclonal antibody specific for IL12 p70 has been pre-coated onto the microwells. The IL12 p70 protein in samples is captured by the coated antibody after incubation. Following extensive washing, a polyclonal antibody of biotinylated specific for IL12 p70 is added to detect the captured IL12 p70 protein. For signal development, Streptavidin-HRP is added, followed by Tetramethyl-benzidine (TMB) reagent. Solution containing sulfuric acid is used to stop color development and the color intensity which is proportional to the quantity of bound protein is measurable at 450nm with the correction wavelength set at 630 nm. Interleukin-12 (IL-12), is a cytokine that is secreted by activated phagocytes and dendritic cells and that induces interferon-γproduction by natural-killer and T lymphocytes. IL-12 (referred to as 'p70') is a 70 kDa heterodimer composed of a 35 kDa subunit (IL-12A p35) and a 40 kDa subunit (IL-12B p40). IL-12 is involved in the differentiation of native T cells into Th1 cells. It is known as a T cell-stimulating factor, which can stimulate the growth and function of T cells. IL-12 plays an important role in the activities of natural killer cells and T lymphocytes. IL-12 also has anti-angiogenic activity, which means it can block the formation of new blood vessels. IL-12 has been shown to play a critical role in the pathogenesis of a variety of immune-related diseases.